When you're starting a business or your business is still in its initial growth phase, it can be overwhelming and hard to know where to start when it comes to your visual brand. You've surely heard that your brand is more than just a logo; it's the full experience that a person has while interacting with your business. Building that brand is something you'll do every single day, but for now, we're going to focus on your visual brand. My best recommendation is that you first articulate your "why." Why did you start your business? Did you want to share your skills with paying customers? Did you want to have control over your own daily schedule? Do you have a product that will make people's lives better? Keeping this motivation top of mind will not only help you discover the path to take with your branding, but it will help inspire you keep going on tough days. We can all use a bit of that! I used to work in the nonprofit field, and what I loved about those organizations is that they each had a mission statement, which is a simple one to two sentence declaration of what the organization does and stands for, like providing musical experiences to inner city children to help them grow and learn, or delivering food to those in need in the community. All decisions go back to whether or not they are serving the mission. Consider writing a statement like this for your business! From there, identify what values or principles you abide by in your business. If you offer services, it may be as simple as providing an excellent, efficient, and collaborative experience. Or, maybe you believe in selling only local, handmade products. Your values are what make your company special and make people want to choose working with or purchasing from you over someone else. 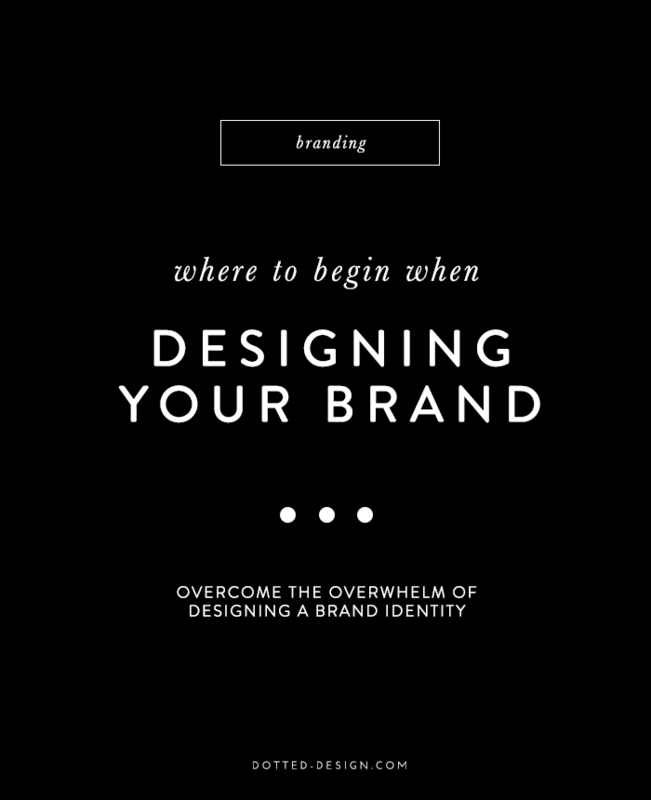 Keeping these top of mind as you design your visual identity will make a world of difference. Another important item is to understand your target market. You can create a beautiful brand, but if it isn't a good fit for your audience, there will be a disconnect. Your brand will evoke certain feelings and reactions in your customers: do you want them to feel inspired? Comforted? Delighted? Invigorated? Whatever it is, you'll want these feelings to begin to emerge in your visual brand. If you want them to feel soothed, a bright red might be a poor color choice. If you want to feel playful and fun, a stark, serif font could send the wrong message. Think about what your audience is seeking, and help them understand how they can get it from your business. Take a look at your competitors or peers. If everyone in your industry is using watercolor floral accents on their websites, you'll know that you want to steer clear of that concept in order to stand out. It can be easy to get caught up in trends and feel like you should hop in bandwagons (like using Madina Script -- it's beautiful, but seemingly everywhere right now ; ) you'll make more of an impression with strong, unique design choices. Keep it simple. If you are new business and can't afford to invest a designer yet, my best advice is to try not to go overboard with your brand visuals when you dive in. Nothing says amateur like trying to incorporate five Photoshop techniques that you just learned on YouTube into one tiny logo. Choose a classic typeface and create a type-based logo. Select a small color palette of two to three colors and a neutral or two (like white, cream, pale gray, etc.). Purchase a few solid stock photos to use on your website. As your brand grows and you understand your values and audience more deeply, you will have the room to expand your visual identity. Simple always looks more professional than busy and cluttered. What is your biggest question when trying to design your brand on your own?